Denzel Washington leads his black, brown, red and yellow gunslingers in cleaning up the Old West. Kinda like how black, brown, red and yellow people are still cleaning up the Modern Alt-West. Bogue offers a pittance to the townsfolk to sell their land to him, doing so from the church pulpit, an optic not lost on us – the pollution of religion with capitalism. During this heretical act, and the subsequent cold-blooded murders, that dead-eyed look never leaves his face. Oh, Pure Evil, you’re such fun! It’s so tragic how her husband was killed. Such a horrendous…uh, such a, such a…eh, tragedy…that should never… uh… wait, what was the question again? A black man bedecked in black, on a jet black horse, rides into town, like the stranger in Leone’s westerns. Only blacker. This bounty hunter named Chisolm (Denzel) walks into a bar. Five dead guys later, he walks out with the information he wanted, and an acolyte – drunken gambler Faraday (Chris Pratt). So begins the journey toward Rose Creek, picking up other lone warriors with past demons: Ethan Hawke as dandy Goodnight Robicheaux (we recall his subservient relationship with Denzel in TRAINING DAY), with his sidekick knifeman, Billy Rocks (South Korean-born Byung-hun Lee, visually drawing us closer to SAMURAI with his knives and katanas); mountain man Jack Horne (Vincent D’Onofrio, entering like the bear from THE REVENANT, with an “old prospector” accent. We recall his history with Pratt in JURASSIC WORLD); on-the-run outlaw Vasquez (Manuel Garcia-Rulfo), and outcast Native American, Red Harvest (Tlingit Martin Sensmeier, who also appears on the new TV series WESTWORLD – meaning Sensmeier appears in two things that the great Yul Brynner was in). The casting could get no better on this film! I love the “revisionism” of showing us the West being more variegated than white filmmakers portrayed it in the 50s and 60s. And again, I must stress: though movies like this and UNFORGIVEN et al are called “revisionist,” they are actually NOT “revising” (i.e. whitewashing); they are actually RESTORING the truth of diversity. Denzel is Yul, that’s obvious, and Pratt is his McQueen. Hawke is Robert Vaughn, and I guess knife-wielding Byung is James Coburn. But the remaining characters can’t be matched one-for-one with their ancestors because this movie is a mashup of SAMURAI, SEVEN 1960 and Eastwood’s PALE RIDER (Bogue’s henchmen all wear matching beige trenchcoats for easy identification). The red herring subplot of SEVEN 1960 (Brad Dexter asking Yul if his motivation was hidden gold in the mountain) is now actually the plot, as Bogue is fracking for gold in them thar hills. A strong woman in the lead role, Haley Bennett; no whimpering damsel, but a sharpshooter who “volunteered, insisted actually” on finding hired guns. Look up the definition of “disarmingly hot,” and there’s a picture of Bennett. You don’t look twice at first, slowly coming to the realization she is the New Jennifer Lawrence – younger, red-headier and green eyes-ier. She continues to wear off-the-shoulder dresses and push-up bras around seven rugged, warrior horndogs. I think mayhaps she wouldn’t mind if…? The camaraderie is palpable between men of such skill, though the dynamic between these seven ronin differs from all other versions. When we see Robicheaux avoid killing any of the deputies, he tries to hide it, but Faraday is a joker and calls out Robicheaux’s “cowardice” publicly. But this is not the simple cowardice of Vaughn in SEVEN 1960; Robicheaux’s expertise is undulled, as he demonstrates his sharpshooter skill, so his reticence to kill is seen as PTSD. Yet he is faced with a damned-if-you-do/damned-if-you-don’t conundrum: Vowing off killing – even though it is regarded as honorable in this modern age – makes Robicheaux seem like a coward in the face of aggressors. So when he reneges on that vow and rides back in glory to kill the aggressors, is he doing the heroic thing? Or the cowardly thing in stooping to killing again? Is this his redemption or damnation? THE MAGNIFICENT SEVEN is a thrilling return to the classic western that people forgot how to make until Eastwood showed them how; a return to the mythic West where the hero’s aim is impeccable, his expertise unassailable, his manliness unstoppable. And though there is glorification of violence during battle, the result of being heroic is bittersweet. Though there are inspiring sequences aplenty (one of the seven makes his hero ride through a hail of bullets to sacrifice himself – Hey, *I* want a hero’s death like that! ), though there are movie conventions (the villain pleads for his life in a church, the hero refuses to shoot him, the villain pulls out a hidden gun – you know the rest); though we are shown a new Western reality (when only the minorities ride into the final sunset, are the filmmakers being daring or buckling to political correctness? 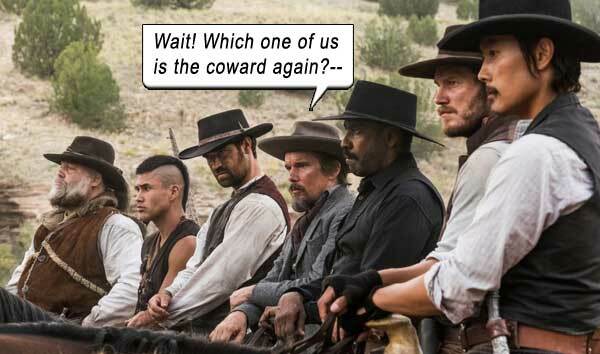 ), this MAGNIFICENT SEVEN retains the hard truth about those who live by the sword. And if you don’t know what I speak of, my child, well, take the time to view the magnificent originals or never talk to me again. Writers: Akira Kurosawa, Shinobu Hashimoto, Hideo Oguni, Richard Wenk, Nic Pizzolatto. Starring: Denzel Washington, Chris Pratt, Ethan Hawke, Vincent D’Onofrio, Byung-hun Lee, Manuel Garcia-Rulfo, Martin Sensmeier, Haley Bennett, Peter Sarsgaard, Luke Grimes, Matt Bomer, Jonathan Joss, Cam Gigandet, Mark Ashworth, Ritchie Montgomery. 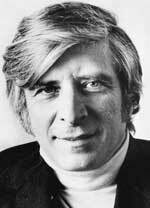 I miss Elmer Bernstein. His orchestral score for the 1960 MAGNIFICENT SEVEN gave that film cohesion; it punctuated every mood sweep. In various permutations throughout the tale, it stirred us to excitement, suspense, triumph, adventure and hero worship, infusing the film with grandiosity from frame one! The music here is by the late James Horner (co-credit, Simon Franglen, who must have completed the work after Horner’s death – ? ), and though Horner is a true craftsman himself (especially noteworthy in films like BRAVEHEART, TITANIC and TROY), his soundtrack here cannot compete with the majesty of Bernstein. With Bernstein’s soundtrack so unstoppable, I really expected this movie to retain it, however, though there are rhythmic snatches that tease us, no candy until the very end, in a full-throated blast of magnificent Bernstein!